Vizio’s companion app for P-Series TVs shows Chromecast how the remote control is done. It turns out you don’t need Vizio’s latest P-Series television to experience one of its key features. As announced on Tuesday, Vizio’s 2016 P-series TVs are the first to have Google Cast built-in, letting users send video to the big screen from phones, tablets, and laptops. More importantly, each P-series TV ships with its own Android tablet, which acts as a remote control using the new Vizio SmartCast app. Even if you don’t have a P-series TV, you can use SmartCast with existing Chromecast dongles or Android TV devices. 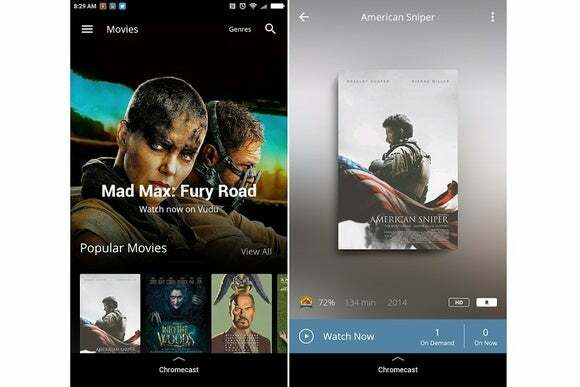 The app, which is free on iOS and Android, basically acts like a TV guide and remote for streaming video, letting you find things to watch and then launch them on the television. Keep in mind, however, that Google already offers similar functionality through its own Chromecast app for iOS and Android. And while SmartCast has some clever ideas that Google’s app lacks, right now it doesn’t integrate with enough of the major streaming services to be very useful. The best thing about SmartCast is that you don’t always have to switch apps to start watching something. If you search for Comedians in Cars Getting Coffee—a show that’s available on the free streaming service Crackle— you can launch it on the television straight from SmartCast. By comparison, searching for the same show through the Chromecast app merely provides a link to Crackle, which you must then install, then open, then hit the Cast button within the app before you can finally start watching. Read our coverage of the launch of Vizio's P-series smart TVs. 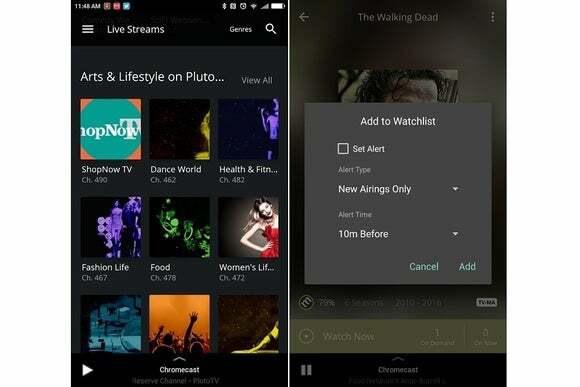 SmartCast also has a tie-in with Pluto.tv, an app that turns online video into round-the-clock streaming channels. You’ll find these channels under the Live Streams section, and again, tapping a channel immediately brings it up on the television, even if you don’t have Pluto.tv installed on your phone. In the future, you could imagine other live streaming sources such as Sling TV feeding into this section of Vizio’s app. The Chromecast app doesn’t have anything similar for live video. Vizio’s app even tries to provide a universal watch list, a concept that’s sorely missing from other streaming devices. This allows users to flag any movie or TV show for later viewing, regardless of what streaming service it comes from, and even get alerts when new TV episodes become available. Live streams and a universal watch list, two SmartCast features that aren’t part of Google’s own Chromecast app. Unfortunately, Vizio doesn’t yet have enough streaming service integrations to feel like the ultimate TV control app. You can’t search for content from Netflix, HBO Go, CBS, Google Play, or Comedy Central, even though the Chromecast app shows all of those services in its search results. And while SmartCast reportedly integrates with Hulu and Sling TV, the app sometimes showed an error message when I searched for videos that should be available through those services. As a tool for Chromecast and Android TV users, SmartCast shouldn’t be judged too harshly, since it’s really just meant for Vizio P-series TV owners. But SmartCast does demonstrate where the Chromecast app could and should be doing better. If Google can provide the same live video listings, watchlists, and direct Cast functionality in its own app, it could be a major leap forward for the phone-as-remote concept.